Delaware's Helmet Rule is Ludicrous | Hupy and Abraham, S.C.
Bill Burke left his home in Pennsylvania and rode to Maryland and Delaware for the Delmarva Bike Week festivities. There is no mandatory helmet law for adults in Pennsylvania but Burke brought a helmet along because there is a helmet law in Maryland. He understood there was no helmet mandate in Delaware, but apparently he was mistaken on that count. While riding in far northern Delaware, a New Castle police officer pulled Burke over. Burke was confused, because he was not speeding and did not violate any other rule of the road. The officer asked to see Burke's helmet, which coincidently was stowed away in one of his bags. After a brief inspection, the officer issued a citation for an "unapproved helmet" which carried a $94 fine with it. It turns out that Delaware has no requirement for anyone 19 years of age or older to wear a helmet, but you must have one in your possession. Can someone please tell me the logic behind that strange law? If the state is concerned that a motorcyclist might have occasion to offer a ride to someone under 19 years of age, how would a person know what size helmet to carry? Afterall, an ill-fitting helmet is about the same as no helmet at all. Here's the language for Delaware Code, Title 21, Chapter 41, Section 4185 (b): (b)Every person operating or riding on a motorcycle shall have in that person's possession a safety helmet approved by the Secretary of Safety and Homeland Security (hereinafter "Secretary") through the Office of Highway Safety and shall wear eye protection approved by the Secretary; provided, however, that every person up to 19 years of age operating or riding on a motorcycle shall wear a safety helmet and eye protection approved by the Secretary. Stopping and detaining a motorist constitutes a seizure and should only be done if there is reasonable suspicion or probable cause that the person has committed or is about to commit a crime or has violated some rule of the road. Interestingly, an important court case challenged the validity of an arbitrary stop right there in New Castle, Delaware in 1979. One could argue that the stop wasn't arbitrary because the helmet wasn't in plain view, but Section 4185 (b) says nothing about the helmet being in plain view. A person's driver's license and registration aren't in plain view, yet nobody would agree that it's ok to stop drivers at random just to check if they have a valid license. Since Burke had Pennsylvania plates on his bike, perhaps the officer took a chance that he didn't have a helmet along with him. That begs the question, why should that matter if there is no mandate for anyone over 19 years of age to wear a helmet in Delaware, and the rider was from a modified helmet law state? Another concern is the officer citing Burke for an unapproved helmet. There is no such animal. FMVSS 218 is a manufacturer's standard meaning the helmet maker is required to certify that the product meets the standard, and unless Delaware provides consumers with some list of "so called" approved helmets, how is anyone to know if the helmet they possess is legal? Back in 2011, the Delaware legislature tried to fix this injustice by passing HB95 through both the Assembly and Senate by large margins. 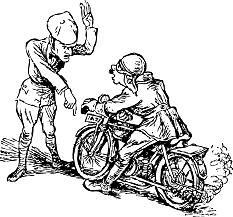 The bill simply eliminated the frivolous requirement to have a helmet in one's possession while riding a motorcycle. Jack Markell, Governor, using some logic known only to himself, sought fit to veto the bill on July 14, 2011. Hopefully, this crazy helmet rule will be revisited and Markell, who is still governor, will see the folly in such a law.